Well look at me, straying away from NARS. What an adventurer I’ve become. After seeing Urban Decay‘s base products appearing in more and more blogs and vlogs, my curiosity was sparked and it finally got the better of me back in July. I bought the Naked Skin Concealer first, after ending up at the Urban Decay counter to find a light base product to take with me on my holiday to Portugal. The assistant helped me out with swatches and recommended the concealer, which I took away with me and loved. She recognised me when I went back to try out the foundation a couple of weeks later so we’re basically best friends now. I know many of us with a paler complexion struggle with finding base products. I also know that (frustratingly) the best pale-skin shade matches tend to be found on high end beauty counters. I’m always wary of splashing the cash unless I already know the product works for me, so I thought I’d review some of the Naked Skin range as best I could. Hopefully this post will give you a better idea of what Urban Decay can offer! £27.99 for 30ml. I would much rather pay less than that for a foundation, truth be told. And yet at the same time I realise that I wear base pretty much every day so I do get my money’s worth. But still, that payment always makes me a bit uncomfortable. A circular bottle with a pump included, definitely got one over NARS Sheer Glow here! The lid is metallic in classic Urban Decay style and the bottle is sturdy — being the clumsy person I am, I’ve dropped it multiple times and it has yet to break. I use the Real Techniques Buffing Brush to work the foundation into my skin — one pump is just about the right amount to cover my face. It works well with the brush and despite the slightly runny consistency (see below) it isn’t too difficult to buff and blend. The formula feels thin and is on the runnier side, so it pays to be careful when you’re putting it on the back of your hand. The coverage is on the sheerer side of sheer-medium but is easy to build thanks to the light texture and the finish is nice and glowy. Not amazing, truth be told, to the point where Naked Skin’s staying power is a deal-breaker for me. Along with my powder it tends to cake on the forehead, no matter how sparing I am, although my forehead is where my oily patch is so that may well be the problem. Still, I’m not impressed. Naked Skin isn’t bad at all, but will I repurchase? Probably not. Its staying power is just not up to scratch (especially when you take my long working day into account) and it also has a very chemical smell. Not for me. £17.50 for a 5ml tube. A round tube with a doe foot applicator and the classic metallic Urban Decay lid. It looks good next to the foundation (which shouldn’t matter either way, really, but I like that they match). The Fair Neutral shade is light — paler than the foundation — but not so light I look like I’m going back to the goth look I used to sport back in the day. It looks particularly pretty under the eyes, since it covers dark circles and gives you a natural-looking glow. I use the applicator to draw a triangle shape under my eyes, then blend it out with my fingers. It also works well with a sponge, although I prefer using my fingers in this instance because they absorb less product. The formula is even thinner than that of the foundation, with a dewy finish. Somehow, the dewiness doesn’t draw attention to spots, which is quite the achievement! I am definitely buying this again! It’s rare for me to find a concealer that covers everything I need to hide, especially in such a perfectly pale shade as Fair Neutral. 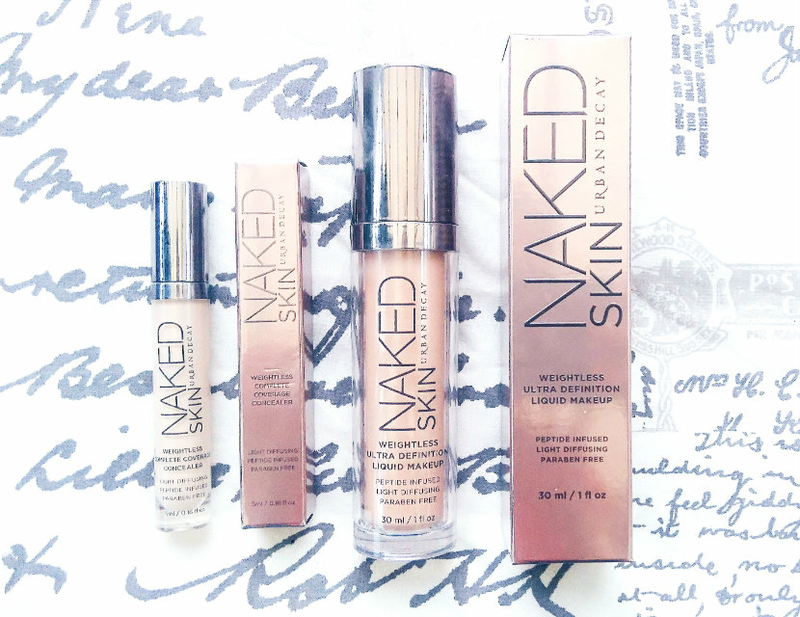 Have you tried anything from the Naked Skin range? Let me know in the comments! Note: Urban Decay do not test on animals but their parent company, L’Oreal, do. For an objective look at the issue of parent companies and animal testing, read Gemima’s post here.